On a Server 2008 R2 machine, I had an issue demoting from being a Domain Controller, after moving the FSMO roles onto a new machine. This was after a second domain controller died. I am not sure of the previous history of where the FSMO roles were for this client. Two new DC’s were created and promoted, after cleaning up DNS to remove the old configuration of the dead DC. 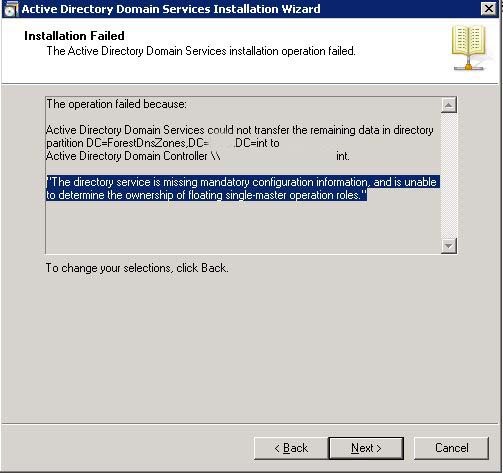 5005 The directory service is missing mandatory configuration information, and is unable to determine the ownership of floating single-master operation roles. Showed the correct server holding the roles. 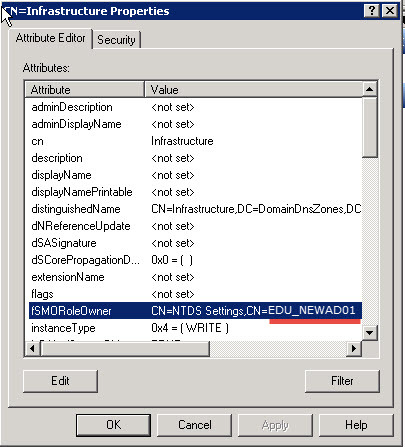 The first dialog box when performing DCPromo.exe shows the name of the new secondary domain controller, however the second event ID, points to an issue in the schema where the OLD record of the dead DC is still been used. Above, you can see 0ADEL in the fSMORoleOwner, which refers to a deleted object (the dead DC). The issue was caused by the second new domain controller having the same IP address as the old Dead domain controller, which lead to the remaining DC getting confused, thinking its missing friend was still alive, and corrupting the editing of the fSMORole Owner. I tried to fix this following this article, but was given an error about security and not allowed to overwrite it. Microsoft KB949257 holds the fix, however due to talking about Read-Only Domain Controllers, most people skip over this, however the script provided does work. You must run it on the FSMO role holder, and then wait for replication. I left mine overnight, and once checked in the morning, I was getting the correct attribute when viewing in ASDI Edit. Although you may find you have not re-used the OLD DC IP address, you may find this issue still applies to yourself. Credit also to this blog post wrote by Chris Davis for pointing me back to the Microsoft KB Article as the fix. Open Notepad, drop the below into it, save as FixfSMO.vbs, run in elevated command prompt “cscript c:\location\FixfFSMO.vbs”.